Boiled rice pudding Etta Soak one cup of rice over night. Add one cup of raisins & tie in a cloth leaving room for it to swell. Boil one hour and serve hot with a cold sauce. 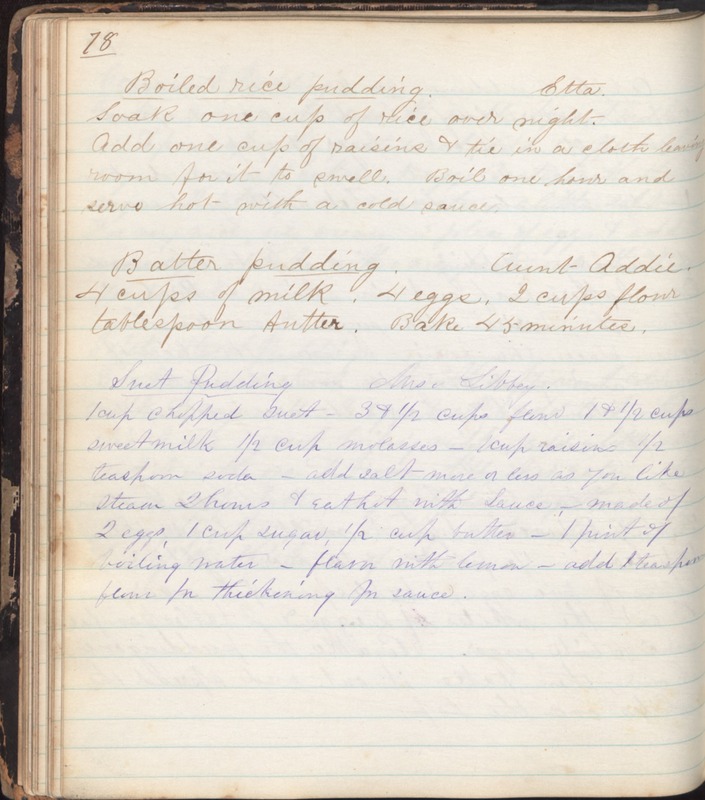 Batter pudding Aunt Addie 4 cups of milk, 4 eggs, 2 cups flour tablespoon butter. Bake 45 minutes Suet pudding Mrs Libbey 1 cup chopped suet - 3 & 1/2 cups flour 1 & 1/2 cups sweet milk 1/2 cup molasses - 1 cup raisins 1/2 teaspoon soda - add salt more or less as you like steam 2 hours & eat hot with sauce - made of 2 eggs, 1 cup sugar, 1/2 cup butter - 1 pint of boiling water - flavor with lemon - add 1 teaspoon flour for thickening for sauce.